- USD enters final innings as currency market king in this cycle. - GBP poised for gains as Brexit saga comes to a close in 2019. - All G10 currencies other than CAD to rise against USD next year. The U.S. Dollar is entering its final innings as the dominant force in the global foreign exchange market for this cycle, according to forecasts from CIBC Capital Markets, and will soon cede ground to other developed world currencies. America's greenback has swept the board of all competition to claim the mantle of best performer in the G10 space this year, thanks largely to a superior performance from the U.S. economy, which has enabled the Federal Reserve to go on raising its interest rate at a time when other central banks have spent much of the year sitting on their hands. But those same winds that propelled the Dollar to its November peaks in 2018 will soon turn against it and leave the greenback humbled once into 2019, as the Federal Reserve comes close to the end of its own monetary policy road and other central banks begin to normalise their interest rate structures. This will have seismic implications for the currency market because of the push and pull influence that changes in interest rates have on capital flows, and their allure for short-term traders. As a result, the Dollar is forecast to cede ground to all G10 currencies other than the Canadian Dollar next year. The Dollar index was quoted 0.06% higher at 97.01 Monday and is now up 5.1% for the 2018 year overall. The Pound was 0.16% higher at 1.2817 against the Dollar but is down -5% in 2018, while the Euro was up 0.05% at 1.1339 but is down -5.45% for 2018. Below is a selection of CIBC's views on what this environment is likely to mean for individual exchange rates. Above: CIBC Capital Markets forecast table. "The BoE have long argued that rising wage pressures would help drive the process of ongoing policy normalization, potentially beyond the long and gradual process of one hike a year. Hence absent the Brexit negotiations, the realization of wages growing at the fastest annual rate in ten years would in isolation point towards the currency garnering interest rate based support." "The conclusion of withdrawal negotiations was clearly beneficial, in the process allowing the EU to call for an emergency Leader’s Summit to rubber stamp the deal on November 25th. However, nascent political infighting within the Conservative party could see the PM facing a leadership challenge, while the probability of the withdrawal bill gaining assent in parliament looks vanishingly small, at least in the first instance." "Eventual passage of the withdrawal bill will therefore come only after sizeable Sterling volatility. A Brexit resolution which avoids the worst case scenario of a no deal exit will open the way for a rebound in sterling in 2019. The prospect of postponed business investment and consumer spending coming back on stream, in conjunction with the BoE looking to extend policy normalization once Brexit uncertainty clears, points towards Sterling rising to 1.36 by early next year." 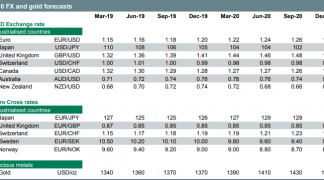 "Continued solid economic data has helped propel modest gains in DXY lately, but that still looks set to unwind in the quarters ahead. A lofty expansion in Q3 was driven by American consumers opening their wallets, but a slowdown in job growth ahead as the economy approaches full employment will limit household spending." "Two interest-rate sensitive sectors of the economy, autos and housing, are already displaying signs of softness when accounting for weather distortions, and the impact of tax cuts on business investment appears to be fading. Some Fed members are starting to muse about being close to the neutral rate already." "Core PCE inflation is still hovering around the Fed’s 2% target, and markets are already fully priced for Fed action next year, but are under-pricing the odds of monetary policy tightening abroad." "Although a global slowdown has eroded Eurozone growth readings lately, domestic demand remains resilient, something that suggests the end of the ECB’s asset-purchase program is coming in December. More clarity on the Brexit front or on Italy’s debt could spark a turning point against the USD." "As the US economy continues to cool from a torrid pace of growth, and investors start to come to turns with the likelihood of a sizeable drag on growth from government restraint in 2020, the greenback is poised to depreciate." "Investors have rebuilt net EUR shorts in response to heightened political uncertainty and lacklustre growth readings in Q3. But despite the Italian government pushing back against the Commission on budgetary issues, we do not expect tensions to evolve into something more material, thereby still allowing for euro appreciation ahead." "The deterioration in the macro backdrop in Q3 was largely due to transitory factors, including German auto output that was interrupted by emissions testing issues. With the slowdown in growth being short lived, and economic growth expected to remain above potential, the ECB’s policy assumptions could be revised soon given their more upbeat tone in communications." "Overall, while the euro is still set to strengthen, our trajectory has been revised lower given recent weakness, with EURUSD now set to reach 1.23 over the course of 2019." "We’re still fairly constructive in our AUD view. Despite concerns related to an over-indebted household sector, the Australian economy is performing just fine. A solid Q2 result led the RBA to upgrade its H2 2018 growth forecast from 3.25% to 3.5%, while GDP is also expected to average a respectable 3% into 2020." "Speaking of the RBA, it’s set to remain on hold until at least the latter half of 2019, preferring to see some signs of wage growth of 3% to offer some reprieve to the indebted household sector. However, risks to domestic wages are higher given that capacity utilization has recovered to levels that have justified rate hikes in the past. This should feed into consumer prices." "With AUDUSD bouncing back from year-to-date lows and with speculative shorts beginning to be pared back, the balance of risk for AUDUSD has begun to shift to the upside. Although US/China trade tensions and weaker Chinese demand remain a concern, our view is that the market has already priced in a large degree of downside risk." "Despite the shocking Q3 CPI number, the RBNZ still kept its projected rate hike at Q3 2020. Although Governor Orr struck a cautious tone at the latest meeting, the removal of the reference to the next rate move being “up or down” significantly reduced the likelihood of a cut. Our view is that the Bank should be moving sooner rather than later, especially with the unemployment rate at a 10-year low of 3.9%." "Higher capacity utilization, lower immigration, and worker-friendly initiatives from the new government may put upward pressure on wages and pass through to inflation. This is in line with the Bank’s inflation estimates in its November MPS where 2019 was revised upwards from 1.6% to 2.1%. Firmer consumer prices, a strong jobs report along with a somewhat constructive RBNZ has caused the NZD/USD to rally off year-to-date lows." "Nevertheless, speculative positions are still heavily short which implies that there is still an opportunity to play NZD/USD upside." "Although weakness in both WTI and WCS has tempered expectations for a December Bank of Canada hike, a modest further dose of hikes could be on the agenda in early 2019 if OPEC sufficiently curtails production. But the loonie will track weaker than we earlier thought until that happens, and our year-end level of 1.31 for USDCAD entails a slightly softer Canadian dollar than our prior forecast." "Hawkish BoC rhetoric, and the lack of a C$ jump on that talk, allowed us to add a rate hike to our BoC outlook for 2019, again, assuming some recovery in oil. A couple of hikes in the first few months of 2019 would see the Canadian dollar appreciate, but we see levels below 1.30 as opportunities to sell the loonie, expecting rate hikes to ultimately come in no higher than current implied pricing, and below the BoC’s latest rhetoric which cited a 2.5-3.5% neutral policy rate range." "BoC action will be limited as highly-indebted households continue to adjust to higher interest rates. A slowing economy will cause the BoC to lag the Fed, particularly since, even if Ottawa eases up a bit on corporate taxes, the economy will still be seeing fiscal tightening by Ontario and some other provinces. That should see USDCAD settle in the low 1.30s next year."